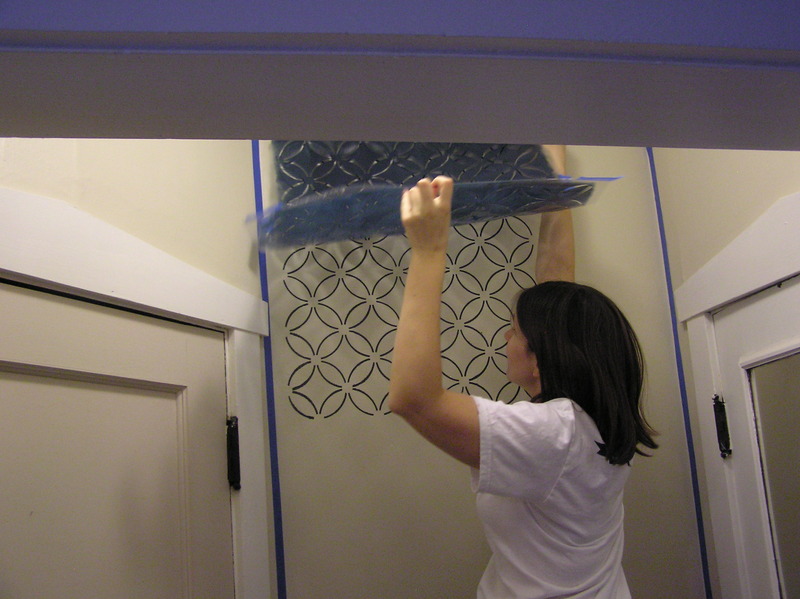 And want a stenciled room of your own? No idea. We both saw and wanted these, so Lesley came down for a quick Sunday afternoon paint and decorate (crazy productive) afternoon. My front hallway is tiny, but has an amazing ceiling. 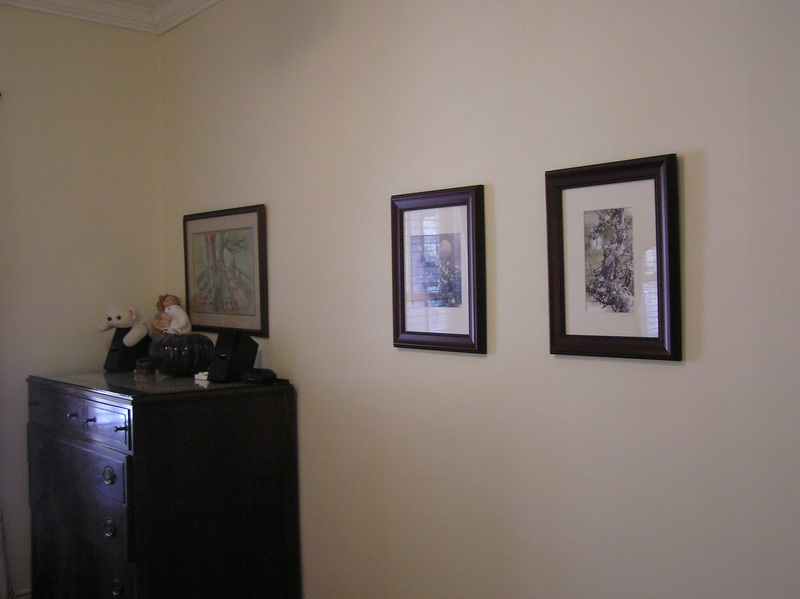 It was the original candidate for being painted a deep, dark color (final winner: this hallway). 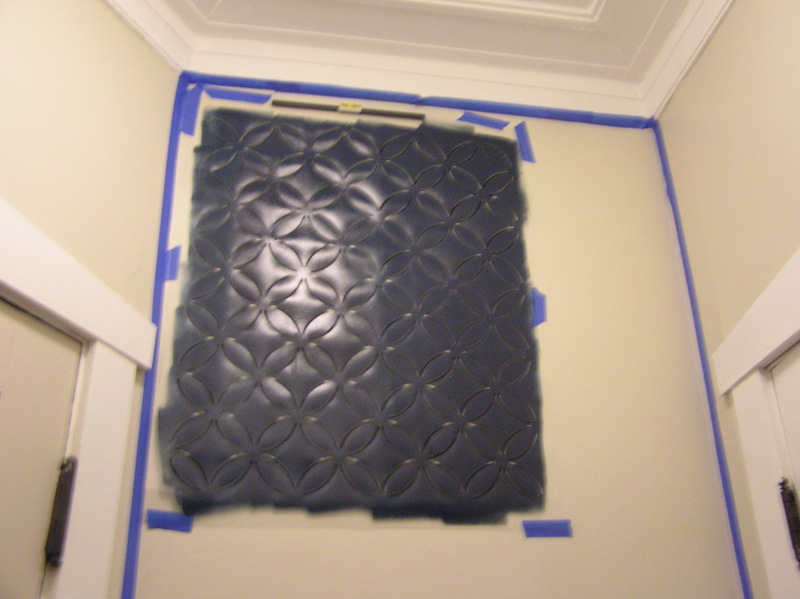 So we decided to stencil it, leaving the cream basecoat and going over it with my dark blue paint. 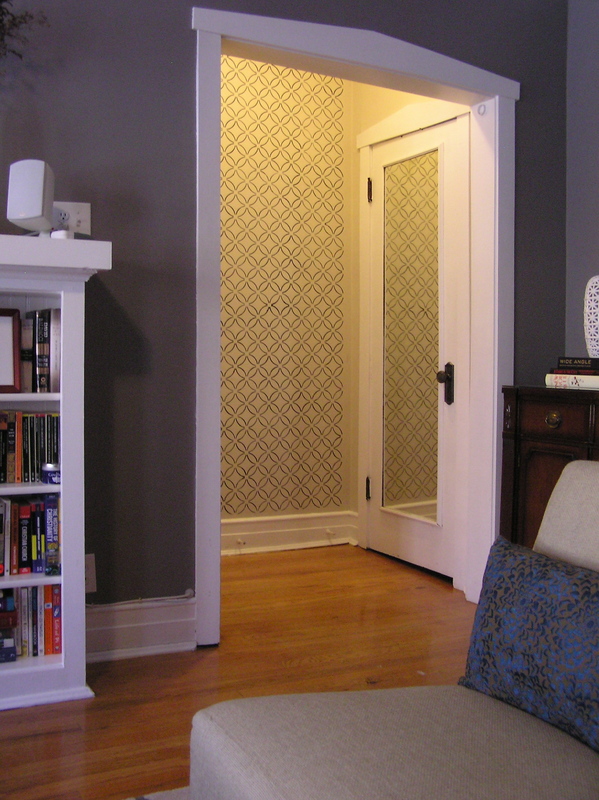 I love the damask and more detailed patterns, but didn’t think they would look right with the look of my living room. So I chose Cutting Edge Stencils Fuji pattern. I didn’t want the dark part to be overwhelming, so I needed something where you weren’t stenciling as much on. Start it off. We had a tiny space, and we actually should have just run the stencil sideways. Oops oh well. Debate and discuss if you should go all the way around. Determine that painting above the doorways would look cool but that getting in all those little cracks around the edges of three doorways (including an acute angle) would probably end up looking bad and driving us nuts. 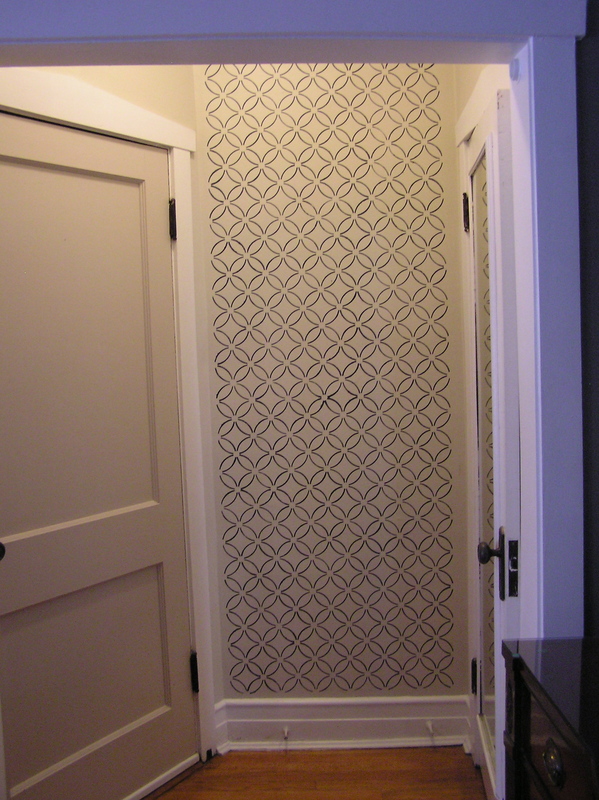 You can barely see it, but they include a smaller edge stencil and also a single stencil to make it easier to do corners and small areas. Get really excited by your results. Bonus! From the couch, the reflection in the mirror doubles the impact. 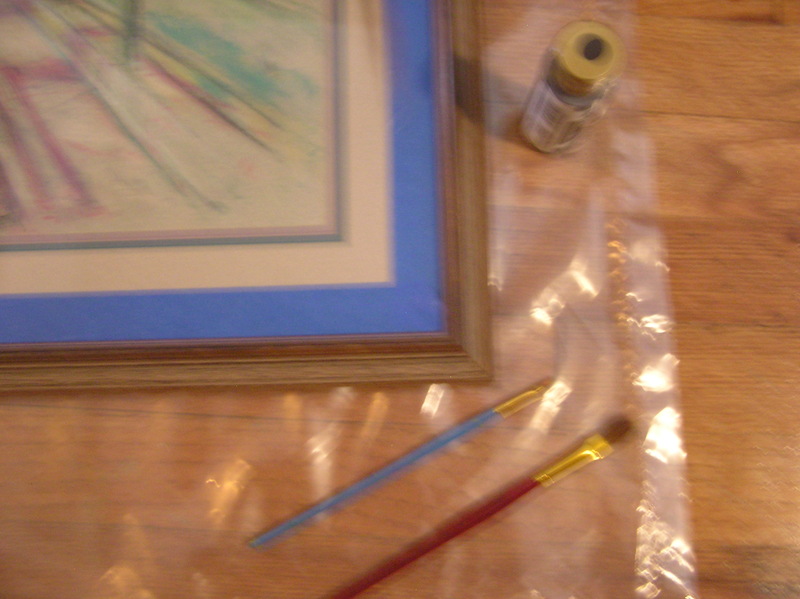 This is so not a pro job, but a quick fix on (yet another) hand me down artwork that my dad gave me. 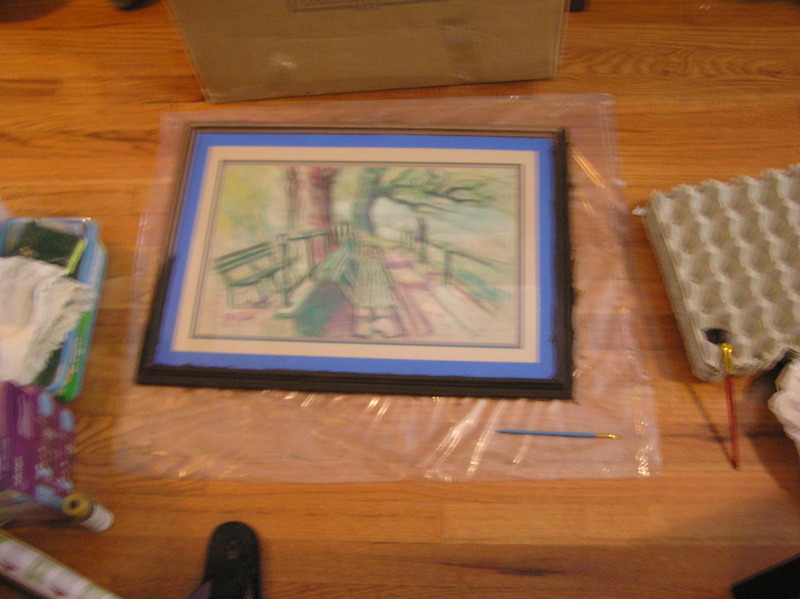 It was professionally framed, so I couldn’t take it out, but it was a pale brown wood with a whitewashed finish and didn’t go AT ALL in my bedroom. So I bought a $1 tube of brown craft paint and got to it. So I mixed some of my Martha paint from Home Depot in there and got a rich-enough and dark-enough finish to go with. Yay me. 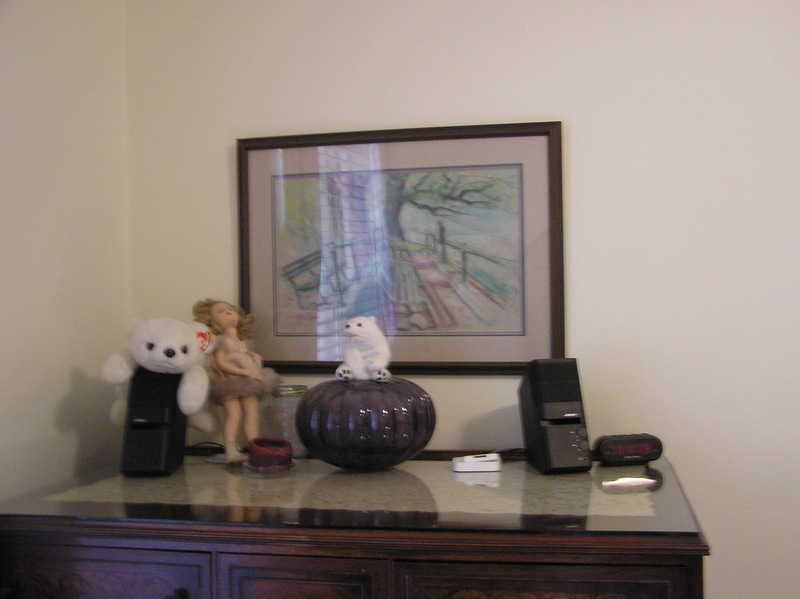 Its not gorgeous, but no one but me really sees it anyhow, and it no longer sticks out like a sore thumb. Win! No longer fighting with the other two frames on the wall. DOUBLE BONUS: We finished putting the new and improved color on the buffet AND Lesley painted her contribution to my birthday present. Win!